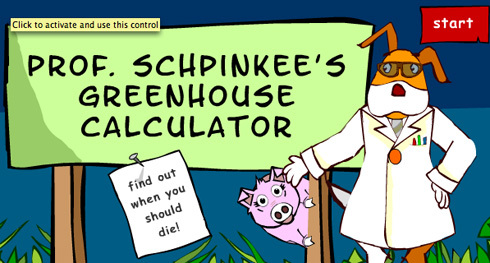 Carbon Cult sickos are under fire for an interactive website that tells children they should die because they emit CO2. It’s one of a number of interactive features that “Get the dirt on greenhouse without the guilt trips. No lectures. No multinational-bashing (well, maybe a little…). Just fun and games and the answers to all your enviro-dilemas,” ABC claims. The site is aimed at 9-year olds. However even a “virtuous” rating (e.g. not owning a car and recycling) is outweighed by eating meat, or spending an average Aussie income – with the result that many 9-year olds are being told they’ve already outstayed their environmentally-compliant stay on the planet. “Do you think it’s appropriate that the ABC … depict people who are average Australians as massive overweight ugly pigs, oozing slime from their mouths, and then to have these pigs blow up in a mass of blood and guts?” asked Senator Mitch Fifield in the Herald-Sun. Which is eco-speak for frighten them witless. However, as the excellent science blog Watts Up With That points out, the site clearly breaches Australian broadcasting guidelines on “harmful or disturbing” content. “Thank God for outraged senators – you can’t buy publicity like that,” PlanetSlayer’s “creative director” Bernie Hobbs crowed to the New York Post. So how, according to ABC, does one appease the vengeful Death God, Gaia? Houses shook across much of Britain as the country experienced its biggest earthquake for thirty years early this morning. Impressively, within ten minutes of the tremors, CSEM (EMSC), the European-Mediterranean Seismological Centre, revealed the cause: a 5.4 magnitude quake with an epicentre 10 miles north east of Lincoln, in the East Midlands. (Within an hour, this was revised to a 4.9 scale quake). CSEM even saves you the from converting latitude/longtiude co-ordinates – it’s integrated with Tele Atlas data, via Google Maps. Despite the availability of real-time information, the instant news media fell back on, er… “calls from viewers”. The BBC and Sky’s radio and rolling news hurried to bring us what we already knew – that a great big earthquake had happened, somewhere in Britain. A resourceful night operator at BBC News took a break from cutting and pasting these reports (“there was a really loud bang” – Jemma Harrison, 22, in Greater Manchester) to find the US Geological Survey’s website – which (naturally) carried rather less accurate information than the real-time sensors in Europe. Publicly funded science, which is supposed to operate on our behalf, did its job – by making available real-time information available within ten minutes of the quake. Not all of it worked – alas, our own British Geological Survey, a member of the EMSC network, doesn’t publish real-time monitoring information. But it shows what we get for our money, when scientists aren’t concocting disaster fictions of their own. Which with gullible politicians and quangocrats in charge, is how they get research grants today. The science network did rather better than the publically-funded media, which demonstrated how badly it has lost the plot. The 24 hour news hacks long since forgot how to do even the most basic research, and now fall back on telling us what we already know. Reading has never been cheaper, and for most of us, requires no additional machinery – only the source material itself. 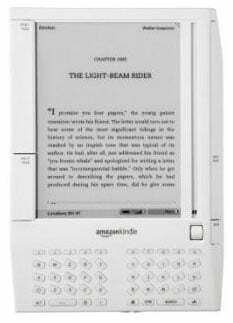 So why do we need to pay the online retailer Amazon.com $399 to read books? The veteran BBC TV composer and arranger Ronnie Hazlehurst died on Monday night. His long career at the corporation produced some of the most (irritatingly) memorable theme tunes: including The Two Ronnies, Reggie Perrin, Last Of The Summer Wine, Blankety Blank and the Morse Code theme for Some Mothers Do ‘Ave ‘Em. But when his obituaries appeared yesterday, there was an odd addition to Hazlehurst’s canon. Apparently he had emerged from retirement a few years ago to co-write the song ‘Reach’, a hit for Simon “Spice Girls” Fuller’s creation S Club 7. “There could only be one source for this,” suggests Shaun Rolph, who tipped us off. Few publications in the world take themselves as seriously as Time magazine, and Christmas each year finds it at its most unctuous and self-important, as Time chooses its “Person of the Year”. This year, the award for newsmaker of 2006 is given to “You” – the internet user. But perhaps not you or me. The kind of internet user lauded by Time doesn’t do what most of us do – window shopping on eBay, adding bon mots to Popbitch or Something Awful, or grazing for free music. It has in mind a special idealised kind of “You” – the wiki-fiddling, bloggers of Web 2.0, or the “citizens of the new digital democracy” as Time editor Richard Stengler calls them. Nature magazine has some tough questions to answer after it let its Wikipedia fetish get the better of its responsibilities to reporting science. The Encyclopedia Britannica has published a devastating response to Nature‘s December comparison of Wikipedia and Britannica, and accuses the journal of misrepresenting its own evidence. Where the evidence didn’t fit, says Britannica, Nature‘s news team just made it up. Britannica has called on the journal to repudiate the report, which was put together by its news team. Independent experts were sent 50 unattributed articles from both Wikipedia and Britannica, and the journal claimed that Britannica turned up 123 “errors” to Wikipedia’s 162. But Nature sent only misleading fragments of some Britannica articles to the reviewers, sent extracts of the children’s version and Britannica’s “book of the year” to others, and in one case, simply stitched together bits from different articles and inserted its own material, passing it off as a single Britannica entry. Nice “Mash-Up” – but bad science.